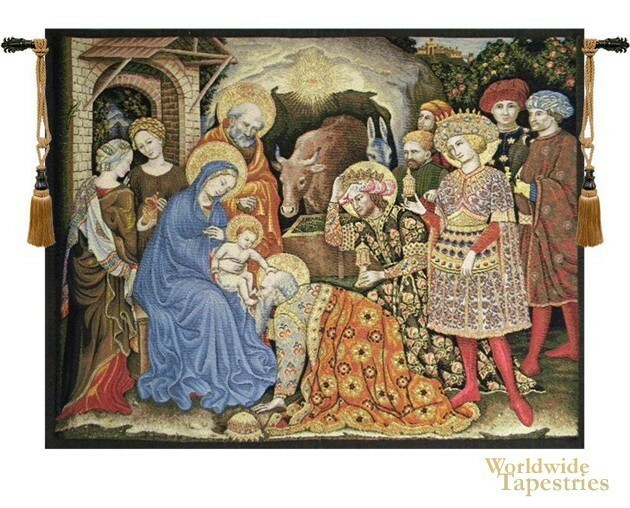 In this religious tapestry "Adoration - Palla Strozzi" we see the nativity scene by Renaissance artist Zanobi Strozzi. Strozzi was one of the pupils of Fra Angelico, and in this piece, we see a most beautiful Renaissance rendition of the Adoration of the Magi. The Christ child is touching the head of one of the wise men, as others look on with admiration. The ones of holy auras have a golden halo around their heads, a classic Renaissance symbol of their purity of spirit. The elaborate garments are seen in detail in this work, in a style that is true Renaissance. This renaissance religious tapestry "Adoration - Palla Strozzi" is lined and has a tunnel for easy hanging. Note: tapestry rod and tassels, where pictured, are purchased separately. Dimensions: W 18" x H 12"
Dimensions: W 52" x H 42"